Everyone needs a break from the news now and then, but some people tune out all the time. Civic engagement is changing, and “fake news” is a growing concern, and so it is important to understand why some people stay away from important sources of information about society. 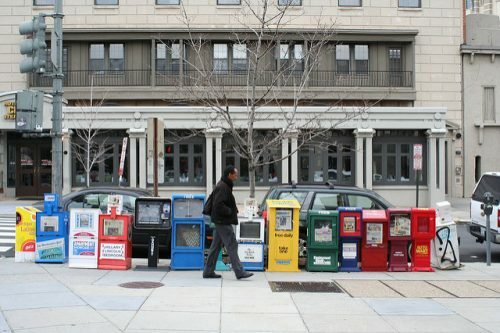 As a journalism studies scholar with an interest in public opinion, Dr. Benjamin Toff recently published a study in Journal of Communication about “news avoiders”—people who seek out news less than once per month. “News finds me.” Many avoiders, particularly those who were also social media users, described a feeling that news is “all around them.” Given the emergence of social and digital media in the past couple of decades, certain avoiders feel they don’t need to take an active effort to read the paper or watch the evening news because all the news they need can be found whenever they log on to Facebook or another social media network. “The information is out there.” Some news avoiders deliberately keep themselves off social media but have confidence that, if they want to find news or information, that the information is “out there.” They describe the internet as vast and useful, and say that any information they might need is “only a Google search away.” These people feel like they can go get news anytime they want to. “I don’t know what to believe.” A third folk theory came from avoiders who felt frustration about finding reliable sources and sorting through all of the information that’s out there. For example, while it’s possible to type a basic phrase into a Google search and see what comes up, these news avoiders talked about how difficult it would be to sort through the information they might find. The mere fact that information exists does not necessarily help people make sense of it or find the facts. The study has three major implications. First, not all news avoiders are the same. We need to take these different concerns into account to better understand why people tune out. Second, improving media literacy requires helping people develop tools for evaluating the reliability of a range of media choices, not just encouraging a general skepticism of all news that many of these avoiders have already internalized. Finally, many avoiders are also politically disengaged, and they see little value to news in part because they have difficulty connecting it to the issues they see as most important in their own lives. This third concern may also reflect real deficiencies with the supply of news itself. Allison J. Steinke is a Ph.D. student at the Hubbard School of Journalism and Mass Communication studying social and mobile media, journalism, and social justice with an emphasis on the anti-human trafficking movement. Follow her work on Academia or ResearchGate. Me parece interesante el articulo pues toca un tema que de inmediato lleva a pensar en cuales podrían ser los motivos de ese alejamiento o distanciamiento de las personas con la realidad. Pues si bien, se encuentran inmersas en ella, al negarse o limitarse a saber que sucede en el día a día en el mundo, su lugar de origen o ciudad, se da paso a la indiferencia social. Sin duda el articulo deja la reflexión sobre la importancia de mantenerse informado y la transformación de la forma en que se reciben noticias actualmente.